A few weeks a go I was contacted by Boohoo, who asked if I’d like to take part in their Style Swap. I gave in my details regarding sizes etc and they matched me with a stunning Parisian blogger, who you can check out here. I loved the idea of this but was immediately thinking ‘what if I hate the outfit that I’m sent’. When the package arrived I couldn’t have been happier. There were a few extra bits and pieces not shown in this outfit post, like a gorgeous bag, necklace and kimono but they’ll definitely be featuring in future outfit posts! This playsuit* is something that I’d probably look at and think ‘I’m too fat for it’, and end up buying a smock dress. I immediately fell in love with it’s long sleeves as I hate my arms, and the neckline as I’ve wanted to try something like this for ages. I did think that the neckline wouldn’t suit my figure but I can honestly say that I love it. I’ll definitely be checking out Boohoo for things similar to this on pay day. I love the pattern and think it’s a great piece for Summer with my legs out (thanks for my awful knees, mum) but also in winter with a pair of thick black tights. These shoes* couldn’t be any more me if they tried. I bought a similar pair to these from New Look not long ago and I live in them. They look amazing with an outfit like this or just with jeans, a nice top and a duster jacket. For someone who doesn’t like heels, they’re a great alternative on a night out, and I wore this outfit to my friends 21st birthday. My little sister has been on the look out for a pair of shoes like this, so we’re definitely going to be sharing these. 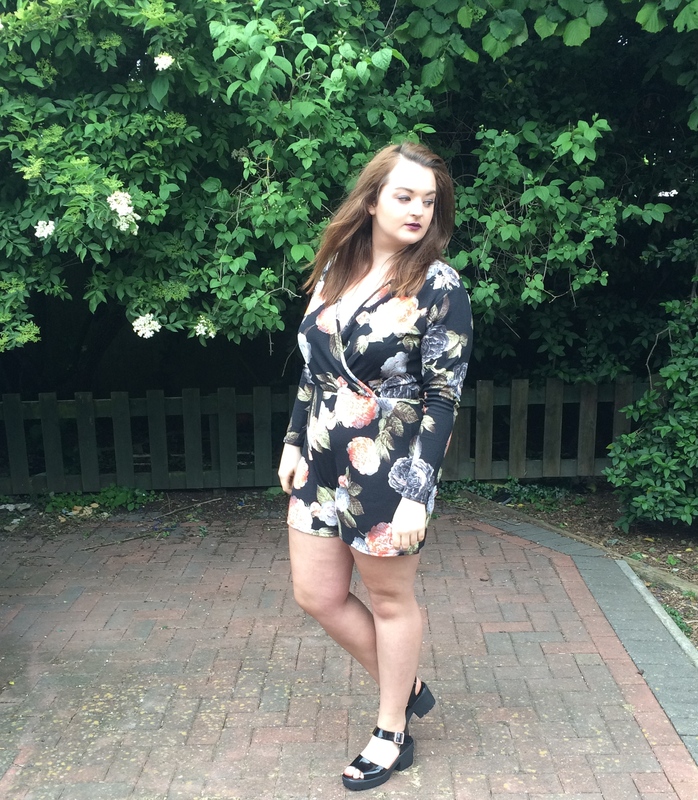 I’m really happy I took part in the Style Swap with Boohoo and although I’m probably regarded as plus size these days (pizza, I love you), I’ve found a style I didn’t think would suit my figure! FYI, Boohoo have a really nice plus size range, so I’d recommend having a snoop if you are around a similar size to me. How would you style this playsuit? You look great! Loving the print of this play suit!!! Yay! I’ve been waiting for this post! 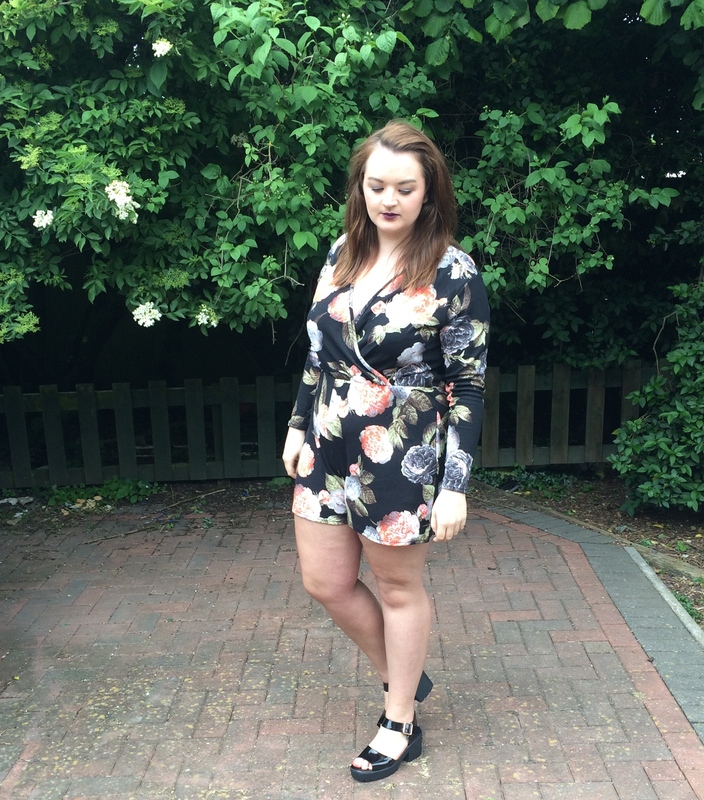 The playsuit looks bloody gorgeous on you, you really do suit it! They got your style spot on that’s for sure! This is such a good idea! LOve the outfit you were sent, you look stunning!